"Think Jewish: Jewish Wisdom for Modern Life"
Cost of the program is $250. You can choose a scholarship. If you complete the program requirements you receive a $350 stipend. Sessions are 2 hours weekly with the option of writing a 5 page research paper, conducting Jewish leadership interviews with Jewish leaders, or leading a discussion group with your friends. A group field trip to NY on a Sunday. My time participating in the Sinai Scholars program was more enjoyable than I could have imagined. I was hesitant at first to join the program only because I had to juggle multiple other classes and clubs. …The intimate conversation setting acted as a cathartic time to cleanse my mind of all of the other academic pursuits of my week and entertain concepts, lessons, and values that were totally unrelated to anything else I was working on. Sinai Scholars became my getaway. The topics we discussed were all interesting and nothing was off the table. All my questions that I thought of were either answered, or, as I found, aren’t really answerable. This isn’t to say that no one knew the answer, rather that the answer wasn’t really important. This idea showed me that, many times, the route to the answer is more important than the answer itself. The discourse and conversations had over dinner each Wednesday, and the differing opinions were a breath of fresh air. I appreciate the time that we got to spend together and how much we grew as a group. From the first lesson through to the last, the relationships we created were quite enjoyable and I appreciated the chance to meet new people, make new friends, and enjoy new ideas. I want to personally thank Alex for convincing me to participate in the entire program. Without their pushing me to enroll, I might not have been able to learn all that I did, and to meet the people that I did during this class. …I am extraordinarily grateful to have done the program, especially to have done it in my sophomore spring semester. I look forward to bringing the lessons, ideas, and community into my remaining years at Penn and into my adult life. …From the first lesson in Sinai Scholars, and learning with a diverse group of Jewish students, I realized that it didn’t matter if grew up as This Jew or That Jew, nor how I labelled myself. Sinai Scholars helped me depart from that mindset and instead focus on Jewish living, and being an active member in the community. …Ultimately, participating in the program helped me understand that it is possible to make Jewish living a part of my life now and going forward. …The program ended up exceeding my expectations. I not only learned valuable lessons from the Rabbi and the book, but also from my fellow participants. The other students were able to show me how they fit Judaism into their lives. This made it easier for me to picture doing the same in the future. After each lesson, I came out understanding a little better about how Jews view the world and certain issues…. Sinai Scholars made me think critically about modern day issues that apply to my life and beyond. As one of my fellow participants said, I can now look at things in my life through a “Jewish lens”. This will help me make decisions based on the values and beliefs with which I most identify. 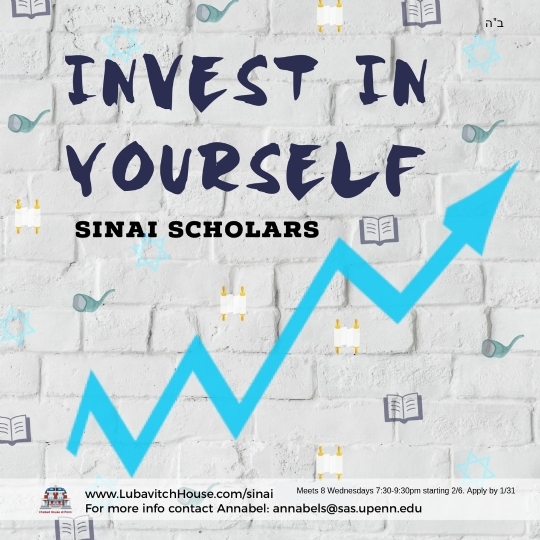 “...Having gone to Jewish day school my entire life, I had experience with many of the topics that were discussed during our sessions… Sinai Scholars offered new perspectives on many of the topics I had discussed previously. The group we participated in was small, so it allowed for everyone to fully participate in the conversation. People had different perspectives on the issues and I really enjoyed gaining new insights into Jewish topics that were relevant to my life, such as marriage. Overall, I am extremely happy I participated in Sinai Scholars. We were presented with various real world scenarios and ways that Jewish teaching can relate to the complexities of the modern world. The way that we can interpret and use these historic teachings in the present day continues to astonish me. We went over various topics that are germane in the world we live in now, and I will likely remember many of the conversations we had… One class in particular that I remember was the moral dilemma situation. We were presented with various situations that apply to modern life, including autonomous vehicles, and discussed the ethics behind the machine’s decision making process. It was interesting to discuss the Jewish thought behind passive and active measures that either contributed—or took away— life. In the future, as autonomous vehicles become more commonplace, it will be interesting to see whether religious ethics play a role in determining the programming of these vehicles…I hope to use the information I gained from the Sinai Scholars classes more often in my life, and to overall gain a deeper understanding on the meaning of life. "I was particularly pleased by how well our discussions fit into some of the other courses I was taking this semester, including bioethics and psychology…it felt like an enjoyable extracurricular activity rather than a true course; I looked forward to coming each week”. "Sinai Scholars gave me a moral ground on uncertain topics and provided a meditative space to get away from a stressful environment." "I looked forward to our lively dinners and discussions on Monday evenings." Despite the sometimes intense and controversial discussions, I felt that the learning environment was quite casual and enabled every student to participate as much as he or she desired." "My initial reservations of not feeling 'Jewish enough' or simply unprepared for the complexity of the topics were quickly alleviated… After completing the course, I feel much more in touch with my religion and have a deeper understanding of its significance in so many parts of my life."